It's long been speculated that the Great Rift Valley in Africa will someday split entirely and create a new ocean, but now we have hard scientific evidence that it's not just theoretical... it is happening now! 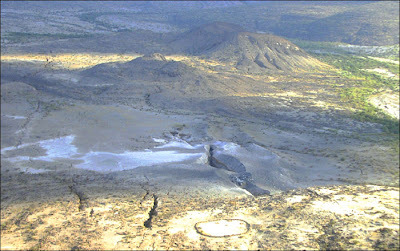 In 2005 a massive, 35-mile long new rift opened up in Ethiopia (part of it pictured at top). According to a new study published in Geophysical Research Letters, it's been confirmed that the same process that happens on the ocean floors of the Atlantic and elsewhere (think Mid-Atlantic Ridge) is taking place in eastern Africa. Someday that rift that you see in the photo will split apart completely and become a whole new ocean! So consider buying up beachfront property now. It'll be worth a lot of money... in a few million years or so.